When purchasing a boiler, it is important for one to know what type he or she needs. There are many different types of boiler systems made by several manufacturers. A good example is an oil boiler. Regardless of the type, boilers are used to heat up water and circulate it to every part of a building. The type of boiler used is determined by the structure of the building and the hot water requirements. Hot water is an important requirement in any home or building, especially during the cold seasons. It enables people to have hot water baths and clean utensils comfortably. Therefore, every building must have a hot water system. Boilers form the biggest and most vital part of a hot water system. This is because, it is in them that the water is heated and maintained at an ideal temperature. Apart from heating the water, boilers also offer storage for the hot water, ensuring that it is available at all times. Boilers are differentiated by several things. Some of those things include the type of fuel they use and the boiling mechanism used. Therefore, it is important for one to understand each type so that he or she can make an informed decision when selecting a boiler for his or her home. There are three main types of boilers, based on the type of fuel they use. The types include oil boilers, gas boilers and electric boilers. Just as their names suggest, oil boilers are oil fired, gas boilers are gas fired and electric boilers use electric heating elements to heat the water. Heating mechanisms vary from one heater to the next. There are conventional boilers, system boilers, combination boilers, combination storage boilers, storage tanks, condensing boilers and back boilers among several others. Each boiler is ideal for different scenarios, depending on the hot water requirements of the building. The boiler is responsible for heating the water. A pump is used to circulate the water, through radiators and pipes, to all parts of the building and back to the boiler. The boiler can either operate on a sealed or open vented system. Open vented systems are ideal for situations where the hot water cylinders are used to store hot water, while sealed systems are used where high pressure is required. There are many advantages of purchasing and installing boilers in building. To begin with, they require little or no maintenance at all. Therefore, the operational costs are low. The systems are also easy to install. Boiler systems can operate properly for several years without maintenance. However, it is important to schedule regular service checkups. This way any minor repairs and replacements can be made before they develop into more complicated problems. 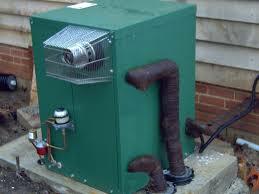 There are several companies that service oil boilers and gas boilers. Therefore, one should do some research and find the one that offers the best services.